Attached is a patch to slightly tweak the GUI colours. before_screenshot.png​ (47.8 KB) - added by humdinger 5 years ago. after_screenshot.png​ (47.0 KB) - added by humdinger 5 years ago. 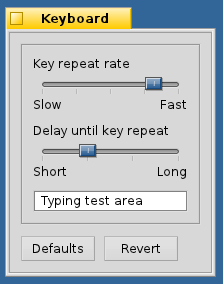 0001-Tweaks-to-GUI-default-colours.patch​ (2.2 KB) - added by humdinger 5 years ago. Bitmap Clip​ (13.7 KB) - added by pulkomandy 5 years ago. 0001-window-border-color.patch​ (1.0 KB) - added by TigerKid001 5 years ago. 0002-menu-selection-colors.patch​ (1.2 KB) - added by TigerKid001 5 years ago. 0003-success-failure-colors.patch​ (981 bytes) - added by TigerKid001 5 years ago. appearance​ (1.9 KB) - added by humdinger 5 years ago. I don't like the white-on-blue colors, either. For what it's worth, I like the blue in the list view, but not so much in the menu. Maybe it's time we update our color palette then. I think having a defined set of colors for the user interface (and possibly using it in other places) is a good idea. This one I think was created from the leaves in the Haiku logo, but I don't mind going with something else. In any case, check success/failure colors in real-world uses (Web+ downloads and the notification window are two places where they are used). As far as my personal preferences in colors go, I don't mind the exact color, but I think the text should be black, and the background a light color. There isn't any place in Haiku where the text is white, and this makes this kind of highlight feel too much different. As far as my personal preferences in colors go, I don't mind the exact color, but I think the text should be black, and the background a light color. There isn't any place in Haiku where the text is white, and this makes this kind of highlight feel too much different. Hi! I'd like to work on this enhancement. What are the specific changes that need to be made? And is the color palette supposed to be the one given in the description, or the one in comment 3. Hi! I'd like to work on this enhancement. Otherise we could just apply the attached patch (possibly after changing some colour values to something else). Well actually there seem to be agreement on everything except the menu highlight change. TigerKid001, since you are interested in getting started with haiku development, I'll let you make these two changes (undo the menu color one, add the window border one) and submit an updated patch. I don't think changing the window border color to yellow is good taste. The idea is that window content (such as graphics) should display against a neutral background, hence the neutral gray by default. Haiku is probably too colorful already compared to modern trends. Let's not make it a default recommendation to change the window border color to somthing glaring. Haiku is probably too colorful already compared to modern trends. While you do have a point, there are arguments for active borders being coloured: The tab of a window could be outside the screen area, and the tab could be concealed by another window in focus-follows-mouse mode. Looking at Windows 8 I'd say the modern trend is towards adding more colors. Moreover, the change to the border color is extending an existing color to more parts of the screen. On the other hand the other changes proposed here introduce entirely new colors, which I think can be considered even worse as far as good taste goes. But continuing to use greyscales only is cheating. I find the different border color helpful as a focus-follow-mouse user as it helps me quickly identifying overlapping windows. But I agree that it is less useful for the other focus modes which always have the focused window frontmost. So, let's keep that separate and start with the changes everyone agrees on: success/failure, and the list selection highlight. Also, I am too lazy right now to go back through the comments, but if I was the only one against the active menu item change, I take it back, I'd be fine with the blue and it'd be more consistent, too. So, the changes to be made are yellow border of the windows, removal of the blue selection highlight (comment 9) and change in success/failure colors (comment 12). Right? FWIW, I agree with stippi. I also don't find the FFM argument very convincing. The active window is usually the one under the mouse in this case. It may not be only when you switch windows via keyboard. Yes, please don't change the default border color. However, we do support changing the decorator, in any case (3rd party opportunity). Perhaps just make each change into a separate patch. The selected patches can be committed in one go, and if one of the changes needs to be undo, can just revert the individual patch. FWIW, I use the yellow active window border, and the white on blue selected menu items. The active window border I find helps distinguish it from other windows on a cluttered desktop, and it blends beautifully into the window tab colour. 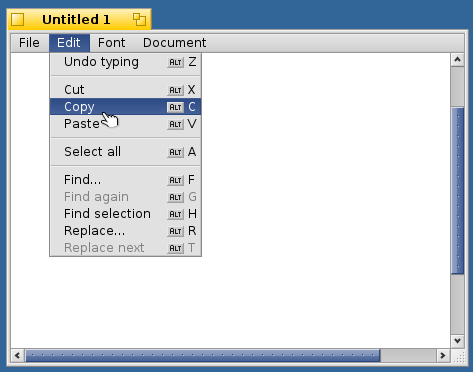 While we all have opinions and I generally find that Humdinger and stippi have good taste, what we really need is a graphical designer to come up with a nice color palette and a new GUI design for Haiku. I know a lot of us are attached to the current look but it is quite dated. But as we always say this is really something for R2 but I don't think it would hurt to experiment some now. I don't agree that our look is "dated". During the 2000s everyone used round corners, gradients and mostly monochromatic schemes. Then everyone got bored with that and switched to plain squares, plain colors, and more colorful themes (look at iOS 6 vs iOS 7 to see what I mean). I think the Haiku look is quite close to the perfect balance between these two extremes. As an evidence, after getting a lot of requests for more round corners and gradients in the UI for 10 years, we are now getting requests for more colors instead (such as this new blue highlight for menu items). We can leave the border color change out for now, there are too much people not wanting it, and the very bright yellow color may distract the eye from the more important parts (what's inside the window). The success/failure colors are ok for everyone. The menu highlight change is ok, but we should try to match other shades of blue used in the system (mainly the keyboard focus indicator). It might make sense to use the blue from ​http://clrs.cc/ (this is where success and failure comes from). Hi, I have applied the patch to change success and failure colors. I'm still not happy with the white text in menu selection, so I tried something else. I've set the color to tle "blue" from ​http://clrs.cc (0,116,217). I use this color for all the blueish things in the preference panel: the navigation base, control point, control highlight, as well as list and menu selections. This color is lighter and allows to keep good readability even with white text, and is strong enough to serve as the highlight for list focus, etc. It may, however, be too strong for menu/list background. Or maybe it just needs some time to get used to. This color is also close to the one we use for BStatusBar. You can see where I'm going: I'm trying to make the UI look more uniform by using the same color in several places, and using a good set of colors (clrs.cc in this case, but there are several other choices available on the net). AFAIK Appearance asks the app_server itself for the current color settings, not the file. The latter is just used for persistent storage, and isn't monitored for changes since it's not generally expected that you'd alter your colors that way behind the system's back. Replying to anevilyak:The latter is just used for persistent storage, and isn't monitored for changes since it's not generally expected that you'd alter your colors that way behind the system's back. Monitoring wouldn't be necessary, reading the setings file on launch of the Appearance panel would do. Anyway, no biggie. Except that wouldn't really be correct, as what's in the file wouldn't necessarily match what's currently active in app_server. Bear in mind, it's not the appearance preflet that controls that file, app_server does. Appearance just tells app_server to change colors when you make selections in it, it doesn't in any way touch that file itself. 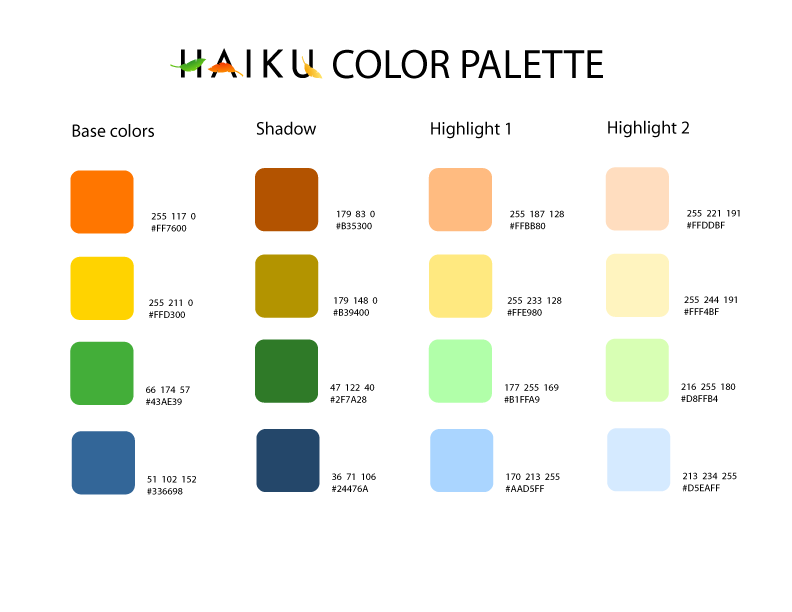 We could use Haiku Theme Manager (​https://github.com/HaikuArchives/HaikuThemeManager) to exchange colors configuration. In ticket:10840#comment:9 I explain that the current selection color of BColumnListView is different from the BListView grey. I would like to uniform the two color. I think the (190,190,190) is more readable. Shouldn't the BColumnListView use simply the same colour as BListView, i.e. Shouldn't the BColumnListView use simply the same color as BListView, i.e. 1) The grey B_LIST_SELECTED_BACKGROUND_COLOR is too dark, there is a selection rectangle that is darker than then selection box (StrokeRect not FillRect). This is used with the keyboard. 2) When the window lost focus, the BColumnListView selection is lighter this is a different behavior from the BListView. A possible solution is to remove this functionality from the BColumListView. When I finished you can use the blue and white and create a theme to exchange with others. Is this inspired by master-of-design on deviantart: ​https://www.deviantart.com/master-of-design/art/Haiku-API-283726334 ? I prefer text to be darker than its background color. Pretty sure it's a better choice for the eyes (better readability), something that becomes more evident in large amounts of texts. But... the dark grey could be made a bit lighter to deal with the urge of wanting to be more modern, while it -more importantly- would also improve the contrast between text and background, which is a bit limited with this current dark grey. White text on a dark background for the selected item increases the contrast making it easier to see the selected item. 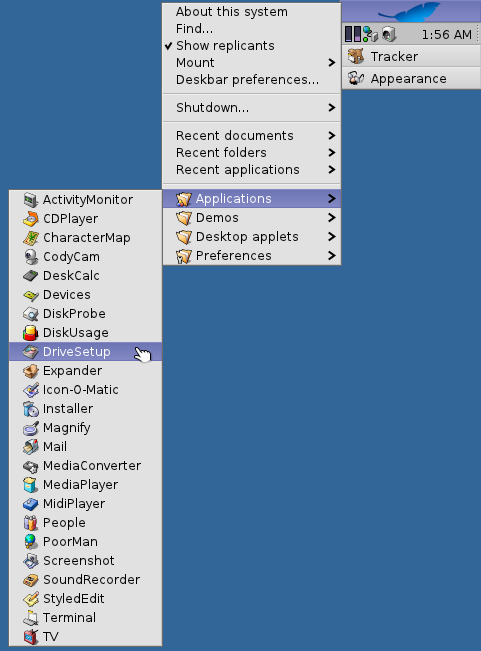 Then again BeOS apps may hardcode black text as their menu selection color ignoring the setting. Not in all cases; you can easily use black text on a light background with just as much -or even more- contrast. Imagine a user having to do serious work for hours on end that involves lots of menu-use. It helps this user's (tired) eyes if the selected item differs from the un-selected items in just one way (which happens to be enough to indicate difference), i.e. by only changing the background color and leaving the color of the text unchanged: that leads to 50% less blink, is more consistent with the other items, gives enough change to be effective, and leads to a more relaxed workflow. With this in mind you can still depart from grey as background color and use (for selected items) a shade of background blue that's light enough to form sufficient contrast with black text.